The four talented fighters competing on a terrific doubleheader on ShoBox: The New Generation tomorrow/Friday, Aug. 24, live on Showtime at 11:00 p.m. ET, made weight Thursday at Fantasy Springs Resort Casino in Indio , Calif. 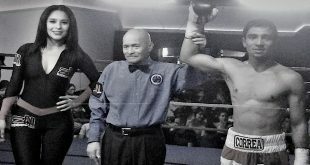 In the 10-round main event, talented, unbeaten, world-rated hometown favorite Randy Caballero (15-0, 8 KOs), of Coachella, Calif. , will defend his NABO Bantamweight Championship against Manny Roman (15-1-3, 6 KOs), of Paramount , Calif. The ShoBox co-feature at Fantasy Springs will match once-beaten lightweights Michael “The Artist’’ Perez (16-1-1, 10 KOs), of Newark , N.J. , against hard-hitting southpaw Fidel Maldonado (13-1, 11 KOs), of Albuquerque , N.M. , in a 10-round bout. Future Hall of Famer, the legendary Bernard Hopkins, will host a meet and greet before the televised card, including signing autographs and taking pictures with fans, from 7:00 p.m. to 8:00 p.m. inside the Fantasy Springs Special Events Center. The meet and greet is open to the public with the purchase of a ticket to the fight card. 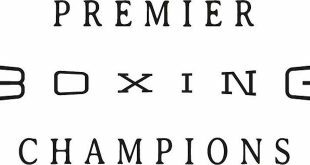 Barry Tompkins will call the blow-by-blow action on ShoBox with expert analyst Steve Farhood and special guest analyst, former Unified Lightweight World Champion Juan “The Baby Bull” Diaz. Gordon Hall is the executive producer of ShoBox with Richard Gaughan producing and Rick Phillips directing. Weights: Caballero weighed 117.6 pounds, Roman 117.8. Perez tipped scale at 134.8, Maldonado 134.4. “It’s always a good thing to fight in your hometown and it is really a big thing to be fighting on Showtime again. I feel my career is going in the right direction. “I really learned a lot from my first fight on ShoBox and have been training hard on not making the same type of mistakes again in this fight as I did in that one. 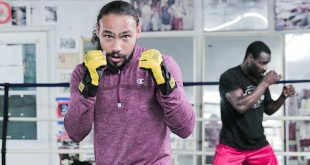 “Roman is a tough fighter no doubt about it, and he comes to fight, but no one is going to come into my backyard and take my belt away from me. Winning the NABO belt was a really big deal for me and I’m not just going to let it slip away. “I’ve had a lot of stops and starts in my career, but I am definitely ready for this fight and feel more motivated than ever. I plan to make the most of this opportunity. “I definitely feel they are making a mistake by fighting me. I’ve had more years as a pro than he has. I just haven’t had the chance to show what I can do on television. 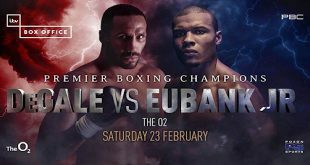 “This is by far my biggest fight and I am treating it like a world title fight. The fact I’m fighting on Showtime against an undefeated fighter that’s ranked and fighting him in his hometown is huge, but mentally and physically I am totally prepared and totally confident. “The huge changes I made before my last fight have really made a positive difference. Physically, I feel stronger. My training camp lasted eight weeks. There were no distractions. I stayed totally focused. There was a lot less stress. “I fought this guy in the amateurs and I totally out-boxed him. He says I ran from him, but I beat him 5-0 so what does that tell you? I know it was only three rounds and now we are fighting with eight-ounce gloves and no headgear, but I’ll be ready for whatever he brings. “I lost a decision to Perez in the semifinals of the Golden Gloves finals when we were amateurs, but he ran the whole time and wouldn’t exchange. I don’t think he threw too much. I’m looking at this as my chance for some major payback. “So many good fighters have fought on ShoBox, so for me to get my chance is exciting. This is a great opportunity for me. I plan to put on a good show. I’m excited, but not nervous. “I feel I am really getting underestimated just because I lost my last fight and went the distance with Erick Cruz and Perez knocked Cruz out, but I came in weak for the Cruz fight; there was a misunderstanding with the contract weight. Caballero vs. Roman and Perez vs. Maldonado are presented by Golden Boy Promotions and sponsored by Corona . Doors open at 5:00 p.m. PT. The first fight begins at 5:30 p.m. PT.